1980 Islander 41 FREEPORT This Islander 41 Freeport in the last 8 years has had new Awlgrip and Non Skid, Fuel Tank, Hood Roller Furl Sails and a NEW Dodger / Bimini with 4-Sided Enclosure and many upgrades. “Molly J” sports all you need for cruising including Generator, Radar, Auto Pilot, AC/Heat, Microwave and Convention Oven, Hillerrange Stove and Oven, Ice Maker, Refrigerator and Deep Freezer, Large Salon and Aft Cabin Master. This is a must see for any live-aboard, cruiser or weekend sailor. Single hand her from the cockpit. REMARKS: Loaded Popular Performance Cruiser with all the Amenities. Offers Welcomed. Call today. 1979 Islander Yachts Freeport 41 This may be the perfect boat for the Pacific Northwest, the comfortable full keel cruiser you've been looking for. Bob Perry did the "Classic Plastic" design, and built in more storage than many 45' boats. You’ve likely seen the design, with the large windows, clipper bow, bowsprit, and ketch rig. Kuokoa has all the amenities you often ask for below, like cabin heat, propane cooking, AC/DC refrigeration, pressure H/C water, and two generous staterooms. The aft cabin is the reason this design is hunted. A solid electronics package includes updated RADAR, forward scan SONAR, chart plotter, GPS, Alpha Autopilot, and is wired for a lap top computer. If you are considering going offshore, the storm shutters are already installed, along with an upgraded Lewmar electric windlass, with remote and chain counter, a dripless shaft seal, roller furling and more. A generous center cockpit with full cockpit cover opens up seasons for warm and dry Northwest cruising.The experienced owner bought this nice Islander 41 to live-aboard, motor to Alaska, and sail when comfortable. Now his plans have changed, and you will want to see this family friendly design, soon! 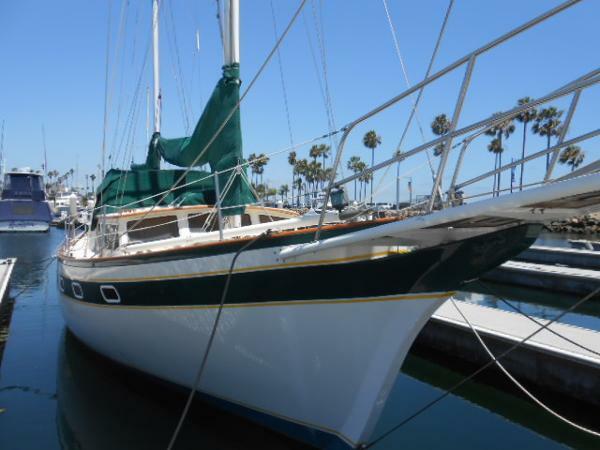 1975 Morgan 41 Out Islander Ketch GREAT LIVE ABOARD and/or OCEAN CRUISER. Spacious Center Cockpit with Full Enclosure. Fully Updated Morgan 415 Out Island Ketch Rig. Completely Restored Inside and Out. Walk Thru on Portside Interior as well as a Walk Over Access to Aft Master Stateroom in Cockpit. Warm Wood Interior w/new Lonseal simulated teak 'n holly sole. New Norcold Stand Up Fridge/Freezer runs efficiently on 110VAC or 12VDC. Two Electric Heads, New Marine Vinyl Upholstery in Salon, Sunbrella covered cockpit cushions. Hynautic hydraulic steering w/ Raymarine ST 6002 Smart Auto Pilot. Well Maintained with quarterly bottom cleaning/zincs and thru hull inspections. 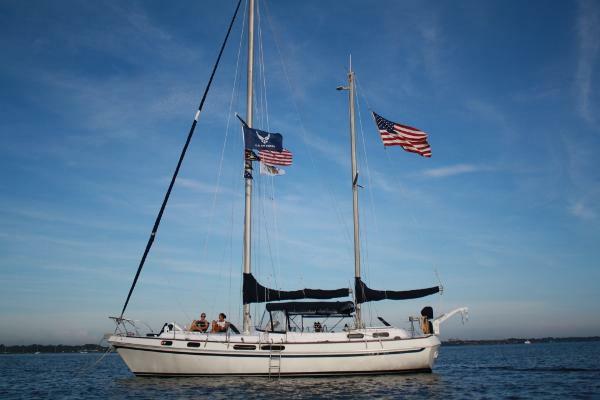 Very friendly for Florida and Bahamas cruising w/ shoal draft yet very seaworthy for long distance cruising. Very reliable Perkins 4-108 and Westerbeke Genset w/low hours on rebuilds.Dual Mermaid Air Conditioners for comfort. Antique Florida Registration = $10 per year! 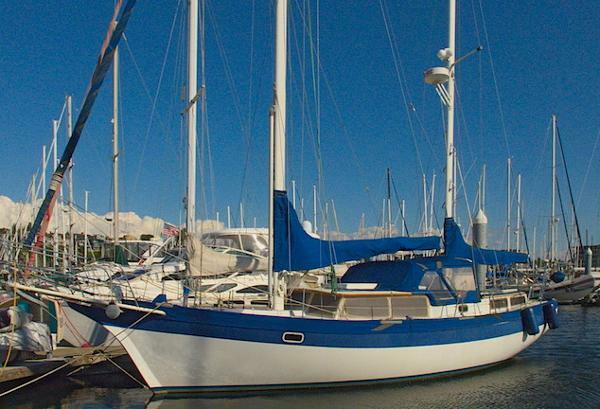 Contact Listing Broker Kevin Welsh for more info and to schedule a showing of this fabulous Morgan 41 Out Island Ketch. Classic 1978 Morgan Out Island 41'3" Ketch rig. Beam: 13'10" Draft: 4'2"
1972 Islander Yachts 40' MS DAUNTLESS was designed by Charlie Davis as a serious blue water cruiser / live aboard. 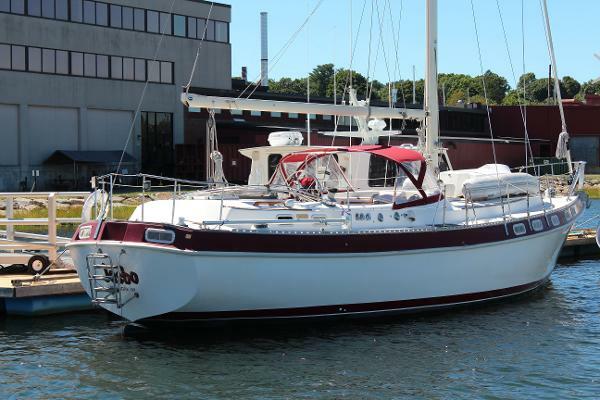 Built in Costa Mesa California this hull/model became the Islander freeport 41'. It has the same heavy duty / thick hull as the Islander Freeport 41'. She is ketch rigged with a center cockpit, full keel, wineglass hull. The center cockpit separates the full beam master suite with ensuite head and shower from the galley/salon and huge V-birth with giant closet and ensuite head. Which provides great privacy. This Coast Guard documented vessel has heavy duty construction throughout (most notably the super thick hand laid fiberglass hull). Think SAFE & STURDY ! The Dauntless has all new wiring and pluming and is solid Burmese Teak throughout, the person I bought this boat from 3 years ago paid $50,000.00 for her and put over $60,000.00 into up-grades and maintenance. With a 13'2" Beam, thereis plenty of living space, great storage and a very generous engine room with excellent access. I have been living on Her for the last few years and love to day-sail her around North Coronado and back. I can single hand her and fly four sails at once, this is knowledge that I would be happy to share with you over a couple of lessons. 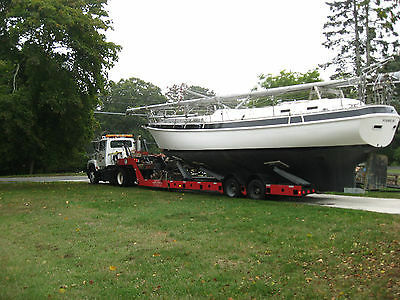 I just purchased a new much larger yacht and need to find a new home for DAUNTLESS. This boat needs cosmetic work like paint, varnish, cushions, curtains, etc. The guy I bought the boat from put most of his money into making sure the mechanical and operating systems were in good order at all times. If you are not handy with a paint brush you might not want this boat. For the person with basic skills I have priced the boat to move quickly. This boat in better condition would sell for $60,000 to $90,000. For all of you StarWars fans out there this yacht is like the Millennium Falcon, she's not much to look at but she has it where it counts. I have sailed all over the place and entertained countless friends on whale watching trips and parties at A-1 Anchorage, Glorietta Bay and quite dinners with that special someone to huge raft-up parities and everything in-between. This boat is designed to be safe and comfortable. All systems have been installed for simplicity, safety and durability. The Dauntless can handle gail-force winds with a reefed main and storm jib, Dauntless will take more punishment than most crew members. 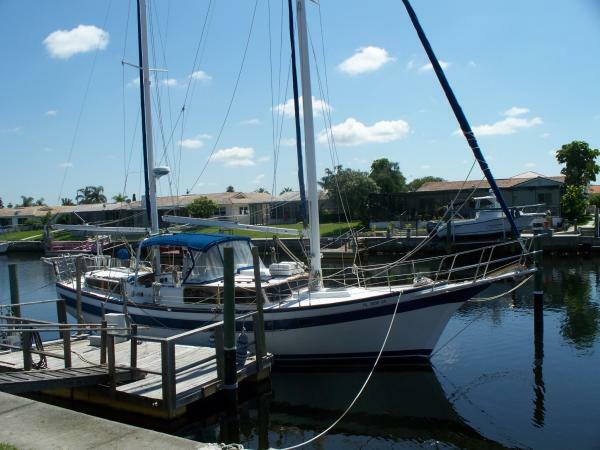 She needs some TLC so this is a tremendous opportunity to own a seriously built blue water sailboat that can take you anywhere in the world you desire in safety and comfort. She makes a fabulous live-aboard (witch I have been doing for the last few years). I AM GOING TO MISS DAUNTLESS BUT HOPE TO LEAVE HER IN THE HANDS OF AN ENTHUSIASTIC NEW OWNER!